In my opinion waste of money. Better to stick with orient and seiko. W.A.S. Watch Acquisition Syndrome Patient. I'm sorry - I just can't. Ask me to convince you to get a Seiko 5, and you'll make my life a lot easier. If you want a swatch, just get the quartz one. It's more worth it. ... and the few real life experiences I had with a Sistem51. It's a novelty - a pricey one, let me add. I personally think there is a lot of pro-Seiko, anti Swiss bias going on here. The Sistem51 is awesome technology at an affordable price. Comparing it to the Seiko 5 doesn't make any sense. Agreed. I got one. Hell don't take your family to dinner one weekend and that is the cost of this watch. I have a pasta weekend at home. Hate-on troll. You didn't earn my money. Mind your own business you incredibly smug, supercilious, inverted snob. I'm actually highly swiss biased, almost all my collection except for gshock are swiss. The problem with the system51 is that it will be useless in 5 years or earlier because it can't be serviced. I love swatches and had been wearing them since my teens, I still have 20 year old quartz swatch running well because all they need is battery change. I guess if somebody is just looking for a fashionable wrist band and will throw it away after 5 years, then go for it. Else, a seiko 5 is much more value & long lasting (similar price points). Have you ever owned a watch longer than five years that was not serviced? I have. They continue to work, and mostly work well. In fact, I would go so far as to say a watch that is absolutely dry will probably run fine for a decade, even in continuous use, but will have suffered a lot of wear in that time making it expensive to service. The Sistem 51 is disposable, with the idea that after a decade or more it will be so out of fashion that one would not wear it. After all, it's a Swatch--a "Second Watch"--none of which are intended as heirlooms. The Seiko 5 is the watch for the guy who wants to give the impression that he has a nice watch but that still only cost him fifty bucks. Sure, it's serviceable, but who would spend a coupla hundred bucks to service a Seiko 5? In reality, they are just as disposable and just as likely to fail as the Sistem 51. But the way the Sistem 51 is made, it does not have all the regulating apparatus and so it is actually more durably regulated--there is no mobile stud carrier or regulator to get jarred out of position if it is knocked about. The other aspect of the styling of a Seiko 5 is that one who wants a watch that looks like that would never consider a Sistem 51, and one who wants the styling of a Sistem 51 would never give a Seiko 5 a second glance. Thus, offering one as a better choice than the other is like saying that instead of that cheap two-seat hot hatchback, buy this stripped-down minivan instead, because it's a better value. The Seiko 5 is the correct answer for someone who asks, "I want a cheap mechanical watch. What's a cheap watch that looks like an adult watch?" The Sistem 51 is the correct answer for someone who asks, "I own 30 watches, and want something that I can wear just for fun when I want to deny the appearance of luxury and act like a kid, but still have a watch that works mechanically." As the owner of many pin-lever watches back in the day, I can say with some assurance that they never lasted long enough to even need to be serviced. And I was a teenager before the Swatch existed. My suspicion is that Sistem 51 watches that are worn a lot will be destroyed by external damage long before the movement fails from lack of service. But I highly doubt many that are owned by adults will be worn every day. Last edited by Rdenney; December 13th, 2014 at 23:14. BarracksSi, WillMK5, mleok and 1 others like this. Hopefully OP didn't spend money on this as a souvenir while in Europe. There are many other things that are better to get. Nothing comes to mind, but even using the money on a nice train ride to an extra country is better than purchasing this. However, if you are back at home, it makes for an interesting addition to the collection from a certain perspective. I can forsee one in my collection, but not necessarily on my wrist. I think it would sit nicely along Seikos as an example of Swiss affordability, but that's about it. I will get one. The Swatch does represent a page in the history of the wristwatch. The Sistime51 continues the Swatch story. I think the service issue is a bit of a furphy. There are still plenty of Swatch auto's released in 93 still going. 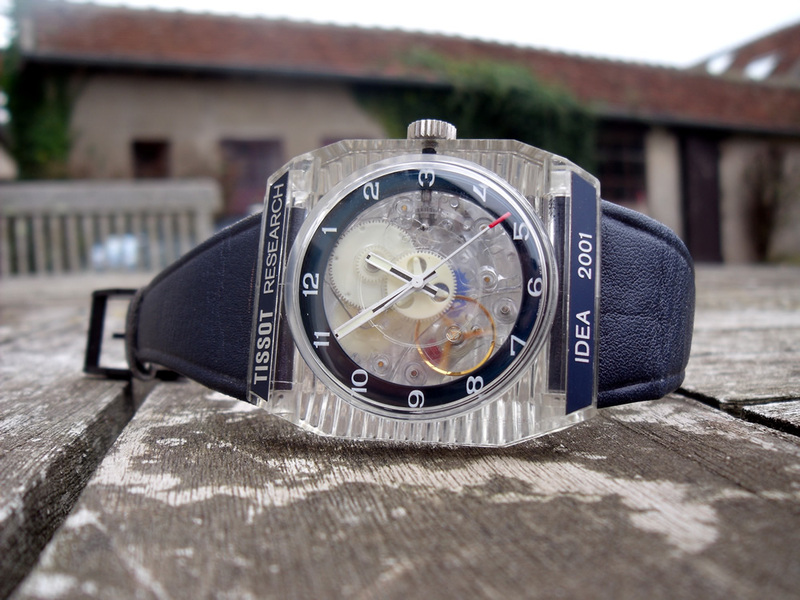 Indeed there was a plastic mechanical watch released in 1971 by Tissot called the IDEA 2001.It had 52 parts. I have one and its still going. It was designed to be self lubricating as the plastics (made from oil)worked in unison. I think they originally retailed for around $12 US but are worth a lot more than that now. Perhaps that will be the same with the Sistime51. Ultimately get it or don't get it but each of us only need to decide if it is a fit in our respective collections. BarracksSi, mleok, Nikoloz and 2 others like this. Can you buy Swatch Sistem51 ? Convince Me To Buy A Tag! Please convince me to buy these 2 froggies!